Where I Got It: I bought this book at Barnes and Noble after seeing several people mention it on Twitter. This book opens with a narrator talking about a murder in which he took part. The body of the novel tells the story of Richard, who transfers to a college in Vermont. He is estranged from his parents and makes a point of fabricating a happier and better backstory for himself in order to fit in with the people he meets. Richard joins a group of five Classics students who work with a very interesting professor. He becomes accepted by the group--Henry, Bunny, Francis, and the twins, Camilla and Charles--but he quickly senses that he is only partially accepted. The group has some dark secret of which he is not privy. After Christmas break, he hears more about the secret as Bunny becomes more and more distant from the group. One night, Bunny lets Richard in on the secret. The rest of the group decides that Bunny must die. From there, the novel depicts the effects of this act, which are increasingly intense. I really enjoyed this book. I can't say enough how much I enjoyed this book. I very quickly got a kind of foreboding, spooky sense as I read. Honestly, I half expected to get to the end and find that all of the main characters had been dead the whole time (they weren't). Some of the critiques that other readers have of this book is that the characters seemed distant and uncaring, particularly after they killed Bunny. I kind of understand where they're coming from. When something catastrophic happens, you tend you be very matter-of-fact about it. I found the characters very interesting. They reminded me of the happier bits of being a lit major...except my friends from that time didn't kill anybody. That I know of. Tartt did an excellent job of creating a very tense story, with lots of twists and turns. I got to the part where Bunny was murdered in the plot and I wondered what else she could do in the remaining 100+ pages. And, boy, did she show me. My main complaint about the book is how difficult it was to place the novel temporally. I thought it was set during the 1950s or 1960s based on how the characters acted. However, you get some odd hints throughout the novel, such as a prevalence of cocaine, finally seeing a direct reference to MTV, making the novel set in the late 1980s. Again, I thoroughly enjoyed this book. I sat down and read for hours on end. As I climbed into bed exhausted and nodding off before I got between the sheets, I would say "Just until I finish the next section" and then I'd read for another 45 minutes. I definitely plan on reading it again. I have been recommending it to all of my friends and family. Tartt wrote another book set in the South called The Little Friend, which I plan on acquiring soon and devouring as quickly as I devoured this one. Wow, that sounds really good but really creepy at the same time! I'm going to put it on my list. Thanks for the great review! I'll also definitely read it again some day! It's been years and years since I read this book, but I remember reading it feverishly in almost one sitting. Sounds kinda spooky but an interesting read! I love books that you can't put down and make you stay up until the early hours of the morning reading. Definitely adding it to my TBR list! I'll be curious to know what you think of The Little Friend. I didn't like it nearly as much as The Secret History. I'm definitely going to have to pull this one off of the shelves soon, as much because of the discussion you and Trish had on Twitter as for the fact that you liked it so much. Anytime a book gets such diverse opinions, I'm more drawn to it than if everyone is raving about it. Great review on a great book. Tartt did a wonderful job creating a really unsettling and creepy atmosphere. I too am interested to see what you think about The Little Friend, though. 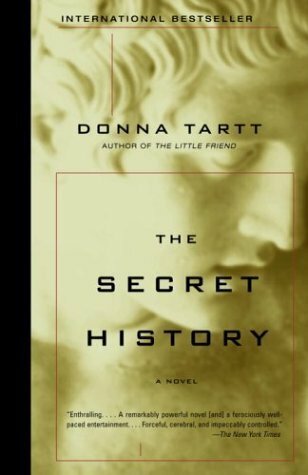 I was so excited to read it after loving The Secret History so much and I have to say, I really didn't like it much at all.